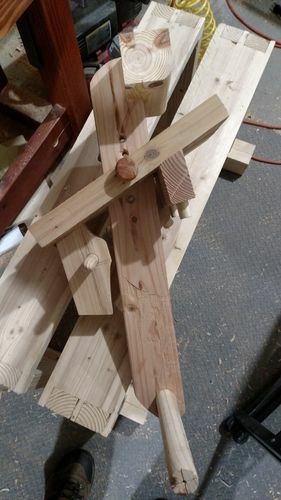 I built a Stumpy Nubs saw bench and it has been great! Make sawing a lot easier so I did more of it which led me to try and make a Three legged stool. 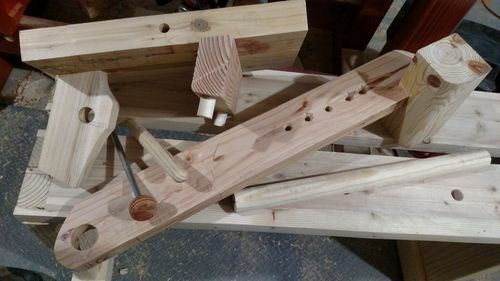 Trying to shave taper tenons made me realize the value of a shave horse but no way could I squeeze one in to my “shop”. All this led me to make a shave pony for the Stumpy Nubs saw bench. It’s held in place with a 1” dowel underneath and the 1-1/2” foot peg comes out so the pony can be removed. Nice! Pretty sure I’m going to steal that idea at some point! Nice! Pretty sure I m going to steal that idea at some point! Great… I’ll be interested to see what kind of improvements you make. Bill , nice jig and congratulations on your ‘Daily Top 3’ award. This is awesome. I like it much more than what I am currently using.